The ZOSI 2.0 MP 1080P HD 4-in-1 Security Camera is one of the most talked-about security cameras on the market today. It is actually a bullet security camera which, on its own, has advantages. In fact, many homeowners would prefer bullet cameras in comparison to other types of cameras due to its flexibility, functionality, and versatility. But aside from being a bullet camera, its cheap costs, features, and functionalities all play a vital role as well as to why this camera is receiving both praises and critics from the security community. And if you are looking for a great bullet camera to install in your home, this guide might be a perfect read for you before purchasing the said product. ZOSI Cameras has become one of the forefront runners in the security industry. They have been producing a wide variety of security cameras on the market for quite some time now. And their experiences with several clients and customers are mainly the reasons for their apparent success in the recent times. But even so, it is not to say that their products are perfect. In fact, many actual consumers have a critical point of views when it comes to their cameras. It is only fitting, though, since safety and security are the factors that are largely in-line with this. In this guide, all of the important details and specifications are included. And this is to help consumers today to know whether the camera is fit for their needs or not. Also, keep in mind that all products, especially security cameras, have their respective advantages and downsides. Hence, it is always wise for you to consider these things. Even so, this guide has included both good and bad aspects of the ZOSI 2.0 MP 1080P HD 4-in-1 Security Camera. The resolution of this camera is rated at 2-Megapixel, 1080P HD. In the security camera industry, these figures are quite basic. And this means that it could provide you a pretty decent quality of output. Also, if you are new to using security cameras, this kind of camera quality is just fitting. Although it gives a pretty decent quality, it is not actually the best in the market. And if you want a really a much clearer output, then this might not be the best option yet. Even so, it could still provide you the protection that you may need any time of the day and any day of the week. The lens of the camera is rated at 3.6mm, which again is a pretty decent figure. It would allow the camera to provide you up to 75 degrees of wide viewing angle. And with these specifications at hand, it is quite safe to say that the camera is great for entry-level users. The ZOSI 2.0 MP 1080p HD 4-in-1 Security Camera features a night vision too. Apparently, it has 36 pieces of built-in IR LEDs which are the very responsible factors that provide the night vision functions. The range of distance that it can cover once this feature is activated can reach up to 100 feet. In comparison to most entry-level bullet cameras of today, a night vision feature that can cover up to 100 feet of distance is already a great specification. This is because some cameras, like the UltraMini Spy Camera and Canary All-In-One Flex Camera, can only cover up to 20 to 50 feet. Hence, you could pretty much rely on its night vision function. In addition, this feature automatically activates itself once the camera has detected a low-light surrounding or when the surveillance area has become dark or dim. Some users take this as a drawback of the camera since its sensors are too sensitive. Others, however, would find this automatic feature a great addition to the camera. The overall appearance of the ZOSI 2.0 MP 1080P HD 4-in-1 Security Camera is quite intriguing. Although it looks pretty much like a common bullet camera, its build and structure are made to appear very unique and stunning. The casing is made from a good grade of aluminum. And it does not rust which actually is very helpful in preserving the overall quality of the security camera. Also, it comes with a 3-Axis Mounting Bracket. This means that you can mount it wherever you want to. As for the color tones, it is in a black tone with a matte finishing to enhance its sleek and neat appearance. And if you ask other actual users of the said camera, they would normally say that this camera looks expensive and not cheaply-built. And in considering the price of the camera, it would really surprise other interested buyers because it appears to be a very intimidating and yet classy type of security camera. In addition, the ZOSI 2.0 MP 1080P HD 4-in-1 Security Camera is designed for both indoor and outdoor use. It features a vandal-proofing function in the casing as well as in its wires and cables. But while it does not have a weatherproofing feature, as mentioned, it does not rust. Even so, it is not very recommended for you to place this camera in the exterior section of your home, especially if you are residing in an area where storms are very apparent. The main thing that ZOSI takes pride in this security camera model is that it features the 4-in-1 video output. And this means that you can connect the security camera in any type of DVR because it is compatible with the 4 most common DVR types. If you have a 960H Analog or CVBS DVR, then you may connect the camera in this DVR. But, keep in mind that connecting the camera in this type would only give you up to 960H camera resolution. Nevertheless, the camera is self-adapted in this DVR. Alongside the 960H Analog or CVBS DVR, the ZOSI 2.0 MP 1080P HD Security Camera is also compatible with TVI DVR, CVI DVR, and AHD DVR. Accordingly, the camera is supported by the OSD Menu Support button. If you are using a TVI DVR, then holding the OSD Menu Button to the right for 5 seconds will already allow the camera to work with the said CVR. On the other hand, when you are using a CVI DVR, you should hold the OSD Menu Button downwardly for 5 seconds to allow the camera to adjust in this setting. As for when using an AHD DVR, holding the OSD Menu Button to the left for 5 seconds will already set the whole system up in this DVR. Because of this feature alone, the ZOSI 2.0 MP 1080P HD Security Camera has become one of the most versatile and flexible security cameras of today. And this is actually a great point for the product since it can largely adjust to the users wants, needs, and preferences. However, it is very important for you to note that the 4 DVR types do not come with the camera. There is only a specific DVR that it comes with. And it has a pre-installed 1 Terabyte hard drive. When viewing footages and surveillance videos, you will need a monitor or computer to be connected in the DVR. It is largely up to you if you will buy a separate monitor for the camera setup. Even so, it is highly recommended for you to have a separate one for a much convenient security reviewing. As for when using your computer, the ZOSI system only supports Internet Explorer. And this is a real drawback for the product. Apparently, it is now rare in the recent times for people to utilize Internet Explorer when surfing and exploring the online world. And the sole compatibility of the security camera system with Internet Explorer is only a proof that the system configuration is not yet really advanced. Nevertheless, keep in mind that you will not need an internet connection when viewing your footages. Once a monitor or a computer is connected to the DVR, it will already provide you with the footages in real-time. Also, remote viewing is not largely supported in this security camera. And this is another point of a drawback for the ZOSI 2.0 MP 1080P HD Security Camera. This is because most of the entry-level cameras of today are already equipped with their respective dedicated applications. Hence, you cannot see or view your footages in real-time when you are not around the house. Although it is believed that there are several workarounds that you can do in order for you to view the footages remotely, they are pretty inconvenient and time-consuming to do. Also, you will need to do a lot of research, trial, and error first before you succeed in making this happen. 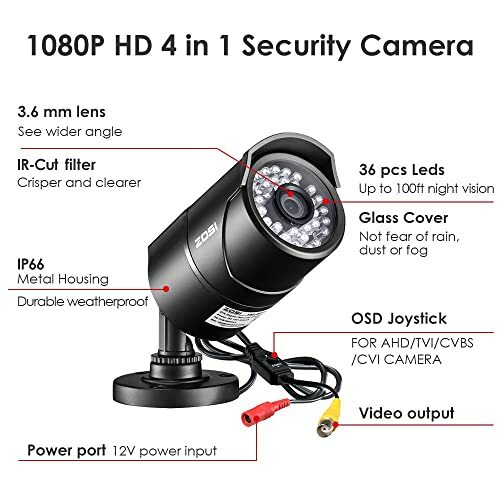 When you purchase this product, the security camera along with its parts are entitled to a 1-year limited warranty. So, when the product breaks down after the year of your purchase, it will be useless anymore. As a result, you may need to purchase a new security camera. Even so, many homeowners have stated that they are utilizing this security camera for more than 1 to 2 years now. As for their technical support, ZOSI ensures their consumers and clients that they will have a lifetime support from their technical personnel and staff. And it is seen that their technical support is quite effective and efficient in helping the actual users and consumers. Accordingly, this is an advantage for the company since they really take good care of their consumers and clients. For a price that falls below $50, you can already have a pretty decent security camera. In fact, even below the $30-mark since the ZOSI 2.0 MP 1080P HD Security Camera falls below this price range. And in comparing to some of the most basic types of a security camera, this type is one of the cheapest. Moreover, when you purchase this package, it already comes with the accompanying DVR, wires and cables, mounting bracket, and instruction manual. Hence, it is already a complete deal and quite a steal too. The main advantages of the ZOSI 2.0 MP 1080P HD Security camera lie in its night vision function, technical support, and price rating. Apparently, if you are to consider the price alone, it is already an advantage for consumers who take the budget as the biggest factor to consider in their buying decisions. Although it is true that safety and security should not be equated with the value of money, it is still essential to consider every now and then the practicality of buying security cameras. As for the company’s technical support, they are found to be very approachable and effective in helping their actual users and consumers. You can actually connect with them anytime and anywhere. Also, as per actual users of the camera, concerns and issues that are apparent in the product are resolved quickly and easily. In addition, since this camera is a bullet type, it important that the versatility and flexibility aspects are largely highlighted. And in this camera, these factors are shown in its 4-in-1 compatibility feature. On the other hand, the main drawbacks of this security camera lie in the quality of the overall camera. Also, it is found that installing and configuring the system is quite challenging. In fact, it may take hours before you can accomplish the whole setup. Moreover, the instruction manual that is included is not very helpful. Furthermore, the remote accessing and viewing is not entirely supported. In totality, the ZOSI 2.0 MP 1080P HD 4-in-1 Security Camera is a great, inexpensive, and versatile bullet camera. And this is very beneficial to people who are looking for a camera that can provide basic and decent quality of home security. However, if you are looking for a camera that can provide you with a high-quality type of support, service, and quality, this may not be the best option for you. Also, if you are a homeowner who travels a lot and wants to secure your home and property every time you are away, this is not the suitable security camera for your needs.